Welcome to the tutorial on SAP reduction strategy. This tutorial is part of our free SAP PP training. SAP reduction strategy is applied to an order when lead time (scheduled dates) of an order is greater than basic dates in the order. SAP reduction strategy reduces the lead time of an order by applying reduction measures. Before getting into details of SAP reduction strategy, let’s understand how scheduling is happening in SAP. Please refer the previous tutorial SAP PP Scheduling. In backward scheduling, the system calculates basic finish date from the requirement date. Total operation lead time = inter-operation times (queue + wait + move) + activity times in all operations. Standard wait time and minimum wait time. The reason is wait time is related to the process can be seen on the example of drying time. After certain time before moving the material to next work station, the material must be dried for 30 mins. This is known as wait time which cannot minimized or ignored. Basic start dates and finish dates are calculated based on material master data. = 12-DEC-2017 – (1 + 3) = 12-DEC-2017 – 4 = 08-Dec-2017. Similarly, schedule start date and finish dates are calculated from the basic finish date. = 12-Dec-2017 – (1 +0) = 11-DEC-2017. Schedule Start date = Schedule Finish date – (Total operations lead time + Float before production). When schedule start date is calculated before basic start date, the system tries to perform the following scheduling approach and tries to adopt schedule dates within basic dates. When schedule start date lies before basic start date, the system starts today scheduling, i.e. it sets basic start date as current date and tries to schedule and calculated basic finish date and schedule dates. If the system finds schedule finish dates lies after basic finish dates after today scheduling, it applies minimum time (wait, queue and move time) from routing. If the system finds schedule finish dates lies after basic finish dates after scheduling with minimum inter-operation time, it tries to apply “Reduction strategy” in six steps. We can define our own reduction strategy in customization. In all 6 steps, the system tries to reduce the inter-operation time gradually except wait time in order to adopt the schedule dates within basic dates. As explained previously, wait time cannot be reduced as it is related to the process. The reason is wait time cannot be reduced is as it is related to the process, for example drying time. After certain time before moving the material to next work station the material must be dried for 30 mins. The system also tries to reduce the operation time by means of overlap time which means next operation starts before the previous operation has finished when minimum send ahead quantity is produced. The lead time of an operation also reduced by splitting the operation defined in a work center. Let’s look into the following SAP reduction strategy defined in IMG. As per this reduction strategy, it applies reduction level while it finds schedule dates lying within basic dates. Reduction 1 Reduce the queue time by 30% and reschedule. Reduction 2 Reduce the queue time by 50% and completely reduce move time, then reschedule. Reduction 3 Reduce the queue time by 70%, completely reduce move time and apply operation split, then reschedule. 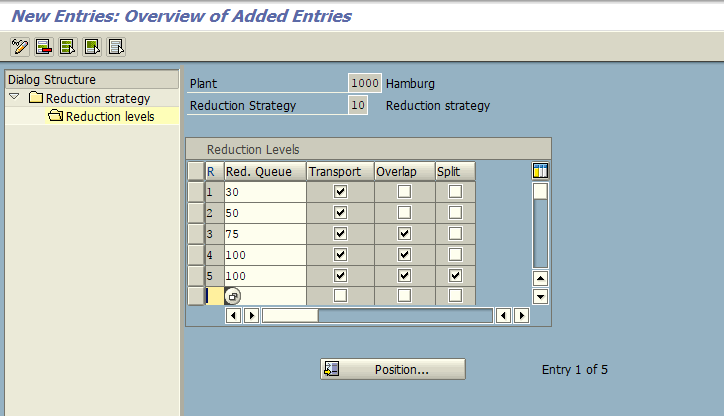 Reduction 4 Reduce the queue time by 100%, completely reduce move time and apply operation overlap, then reschedule. Reduction 5 Reduce the queue time by 100%, completely reduce move time, apply operation overlap and also apply operation split, then reschedule. If SAP system is unable to fit schedule dates within basic dates even after reduction strategy, it provides a scheduling log and schedules the order as per actual dates. 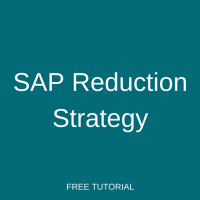 This example of SAP reduction strategy is explained without screenshots as some of the screens may be difficult to understand for beginners. Let’s say for manufacturing product “A”, the following settings are maintained in MRP 2 view of a material master. Also, the following settings are maintained in a routing. Let say we have only one resource used to produce Product ‘A’ available all days (working day) and its available time (capacity) is 24 Hours/day. When we create an order with requirement dates of 30-JAN-2018 for 3000 KG for the product ‘A’, the system calculates dates as follows. Here, schedule start date does not lie between Basic dates. So, the system tries to apply minimum Inter-operation times instead of standard time. 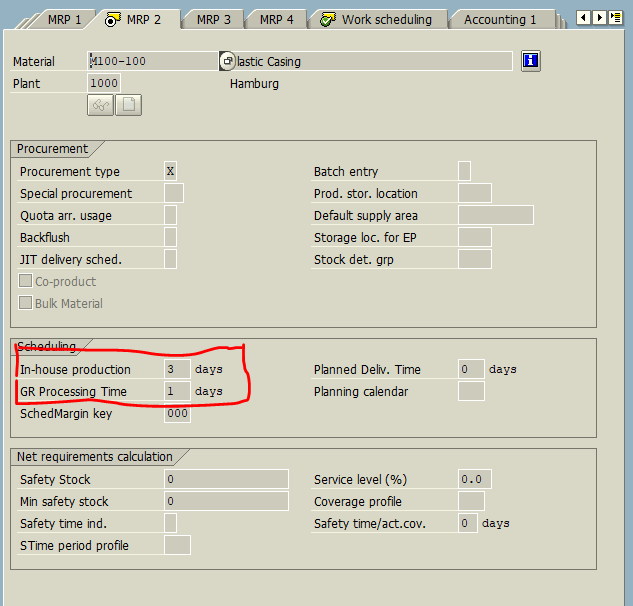 After using minimum inter-operation time, schedule start dates still does not lie between Basic dates, so the system will try to apply SAP reduction strategy level by level. For every reduction step, the system will reschedule the order. 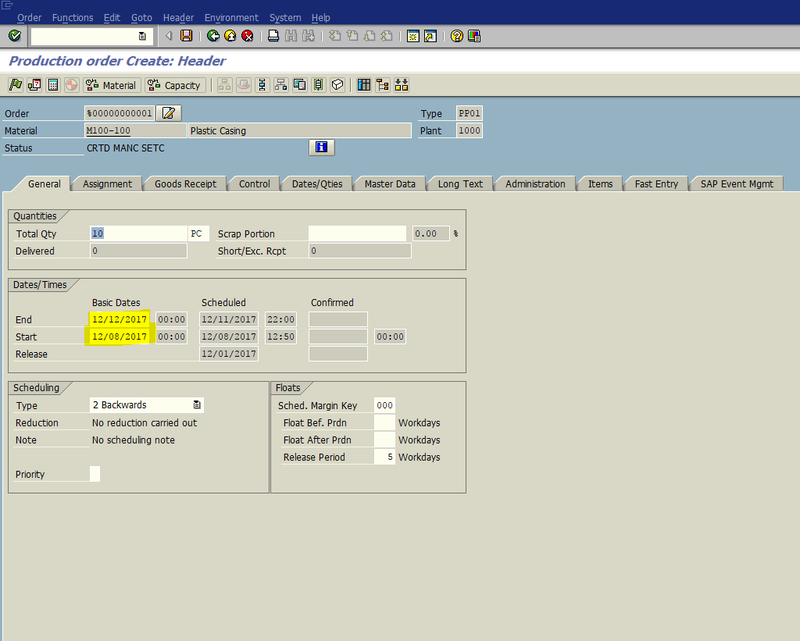 When the system finds that schedule start dates lie within basic dates, it stops reduction and schedules the order.